Reisewarnung für die USA aufgrund illegaler und willkürlicher Verhaftungen in den USA. Travel warning for the US due to illegal and arbitrary arrests in the US. تحذير من السفر للولايات المتحدة بسبب الاعتقالات غير القانونية والتعسفية في الولايات المتحدة. هشدار سفر به ایالات متحده به علت دستگیری های غیرقانونی و خودسرانه در ایالات متحده. تحذير من السفر للولايات المتحدة بسبب الاعتقالات الغيرالقانونية والتعسفية. 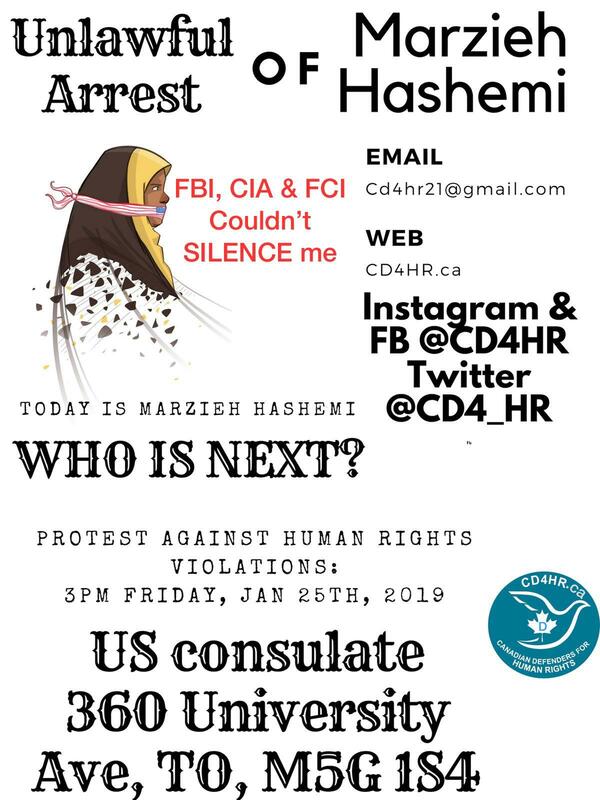 On Friday 25th January there will be protests held outside the US Embassy in London – as well as other cities around the globe – in reaction to the recent events surrounding sister Hashemi. Without a doubt, this is a very important step forward and I commend and congratulate you all, in advance, for participating and making an effort for such a noble cause. However, there are two spiritual traps I would like to humbly share with you all. These are important to acknowledge and then incorporate within ourselves when making the ‘intention’ to participate. These potential traps are (i) who are we protesting for? and (b) what makes a protest ‘Islamic’, rather than merely a humanitarian cause? Sister Hashemi was chosen by Allah to undergo such a test and what an honour this was and still is! Whether or not she personally makes the most of it, is a private matter between Allah and her. That which concerns us, is that she has been assigned a ‘means’ to what can become a potentially, albeit small, Islamic awareness upheaval. What is important is how we, the Ummah, are to react and inshallah benefit from such an episode. Protests and peaceful demonstrations was inevitable and the fact that it’s happening is a positive move forward. However, how are these protests to be introduced and manifested to the onlookers? Who are we protesting for? Marzieh Hashemi? Answer: Not anymore! This is no longer about one individual and we must be aware that making all these protests for one individual would be wasting our ultimate goal. The goal is not to save Marzieh Hashemi. This should now become or is becoming a by-product of the Ummah’s efforts. The goal is much larger than one person. We would be doing a disservice were we to focus on sister Hashemi alone. In a clip released – in Farsi – by Husayn Hashemi (son) a very important and subtle point was made reference to and that was once sister Hashemi was imprisoned her agony – as well as that of her family’s – had become directed to the hundreds and thousands of other Muslims who are being imprisoned helplessly without receiving any spiritual or financial aid. Our duty has become manifold at present. These protests on Friday must manifest Islam and how we are one Ummah caring for all its members, one body caring for all its limbs. I humbly urge the slogans and posters and speeches and rallies to manifest this point and share with the grief of sister Hashemi and all those Muslims being held and are totally helpless and in need of help. By working in the interests of such Muslims, we would be enhancing la ilaaha illallaah. That is the goal. It’s not about personalities anymore. It’s a movement for thousands and thousands of Muslims who are mustad’af (suppressed) and that we on the outside are free to assist them in such a plight. The second point is how must we tune our intentions when marching in such protests. Who do we ask for help? What is our intention? Answer: from Allah! and we are marching for His sake alone. This may seem easy to implement but the reality of the matter can only be evaluated in retrospect months after sister Hashemi’s story ends, in that how are we behave thereafter? Do we stop our endeavours. Why should we? Wasn’t it for Allah’s sake? Nothing changes and the goal remains! The objective does not end with sister Hashemi’s story. It continues. The divine order to free the mustad’afeen (suppressed) is our call. As has been discussed before, the suppressed are those who are being hindered in manifesting the attributes of absolute perfection (Allah). Our duty is to maximally actualise this. How do such demonstrations become termed as ‘islamic’? what would a humanitarian demonstration be missing that an Islamic protest does not lack? What is the essential difference between a Muslim and non-Muslim protester? On the outside, they are committing the same action and are labelling oppression as bad but the inside story is indicative of two mutually exclusive mind-sets. The common lay Muslim protester whilst chanting and protesting believes that honour is Allah’s alone and that no-one grants honour or dishonour to an individual save Allah. Hence, they abide by Allah’s order to protect the best interests of the suppressed wholeheartedly believing that honour is His alone and He alone grants honour and from Him alone should honour be sought. Such Muslims do not damage and compromise their dignity by thinking that a given body, institute, system or government would be granting honour to them or the suppressed. They do not belittle themselves in thinking they are the source of honour to others. No, rather they are submitting to Allah’s command albeit tarnishing their so-called image before the taghuti presence surrounding them. However the result ends, it does not matter. That which matters is they have abided by their Lord’s instruction at the detriment of their ego, submitting to His satisfaction and thus maximising la ilaaha illallaah and finally enhancing the plight against suppression. This was the objective of all Prophets. We are not chanting to win or gain something for a person or other individual body. Rather we are in the process of becoming closer to Allah. How? Answer: by practically demonstrating that the values imposed upon the suppressed neither honour nor dishonour anyone i.e. that it is solely Allah who grants honour and dishonour and we submit to this by breaking the shackles of captivity within our souls manifesting the reality that we have freed ourselves from the stereotyped norms imposed upon us and thus act against them by solely relying upon the honour of absolute perfection. Hence, break the pseudo-honour within you (stop attributing things to yourself), rely upon Him and attribute true honour to Him alone and do not seek it via taghuti means. Make the 25th January, Allah’s Day! Don’t waste yourselves! We are not allowed to assign ourselves as the suppressed! Our goal is to incorporate Allah’s attributes within ourselves. As to the medium through which this can optimally be actualised, we shall answer that during future sessions, inshallah. However, the concept of the mustad’af still requires further deliberation. The mustad’af is one whose journey to perfection and whose objective and goal to be Allah-like has been compromised. Their freedom has been hampered either out of their own doing or others’. Such a state should not continue. A people may temporarily experience and live under circumstances whereby they qualify as a mustad’af (suppressed), they must however not tolerate such a status quo and they must not integrate into such a status quo and should therefore retaliate and minimize and endeavour in overcoming such a suppressed situation. Not doing so is tantamount to giving the green light to shame and self-abasement. Some people may have the highest of socio-economic statuses, highest of academia-related certificates and even the highest of seminary qualifications, but as a result of optionally living under a status quo whereby their journey to become Allah’s ‘caliphate’ is barred, they are in reality poor, ignorant and suppressed unless they either endeavour towards correcting the ambiance or in the very least, leave. Yes, they must – a spiritual must I must add – leave and migrate elsewhere where they can more comfortably reach one’s objective and exit the folds of being a mustad’af. Either endeavour or migrate. But never be comfortable with being a mustad’af. In the Holy Quran, 4:97, explicit reference is made to one of the questions angels are to ask many of us. In the aḥādīth, examples of questions that are to be asked are abundantly mentioned such as “who is your Lord?”, “what is your Book?” and “who is your Prophet?” – and we accept this. However, in 4:97, a question is referred to which in and of itself embraces all the ḥadīth questions. Deliberate carefully! When the angels see the poor spiritual status of the person (applies to humans – muslim or non-muslim) and see that the person was drowned in wrong-doing, they ask the person: “in what condition were you in?” Why have you abased and shamed yourself spiritually? Didn’t you have a warner? Why did you make yourself susceptible to all this? Its game over now! no returning back! Why did you do this to yourself? Then, in 4:97, the poor person’s reply comes “we were of the suppressed ones in the land!” Yes, the reason why their resurrection in the Hereafter is so unhuman and as a result of not attaining to perfection and not incorporating divine attributes, they are resurrected as apes, pigs, snakes, predators and the like, due to their integration into a capitalist, socialist, fascist, tyrannical, liberal or anarchical state that had hampered their progress towards perfection and they were okay with it! Then the angels exclaim “wasn’t Allah’s earth spacious for you to migrate therein?” the verse then ends stating that such people’s refuge is Hell and what an evil destination it is to be. Its only when you have correctly endeavoured in not being suppressed (a mustad’af) will you be able to truly reply to questions such as who is your Lord, who is your prophet… Don’t lose the plot. Don’t reverse the equation. All prophets have come to tell us to call upon Allah and reject all forms of tāghūt (16:36). The tāghūt is that which hampers you from incorporating Allah’s attributes. Be it a government, a lifestyle, an ideology etc. We are not allowed to allow the many forms of tāghūt that exist to permeate and diffuse into our lives. Hence, the prescription from Imam Sādiq (peace be upon him) guiding us not to eat, clothe or walk like those who are the enemy, who assign lifestyles and systems whereby Man is inhibited in progressing towards perfection. An Islamic lifestyle dictates one to eat, walk and clothe etc. in a particular manner because that manner is on a par with one’s journey to perfection. The ultimate criterion is how much of the attributes of perfection have we incorporated within ourselves. Allah is absolute perfection and each jurisprudential, ethical and doctrinal article is traced back to absolute perfection and is assigned so that we become more and more Allah-like. So imagine one lives comfortably – without endeavouring to compensate – under such forms of tāghūt and intentionally assign themselves as mustad’af and suppressed, not only have they ruined and wasted themselves, but they have added and participated and propagated and enhanced the tāghūtī system and they will be resurrected with such a system in the Hereafter.